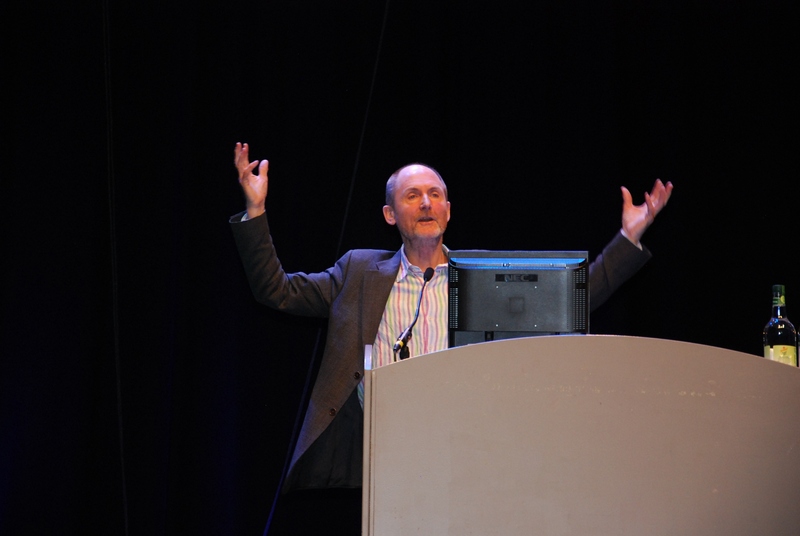 After a series of opening speeches, including IATEFL President Eric Baber thanking the coordinating committee, and the audience giving a big wave to the online audience, Adrian Underhill came on for the opening plenary, speaking on the topic of ‘Mess and Progress’. 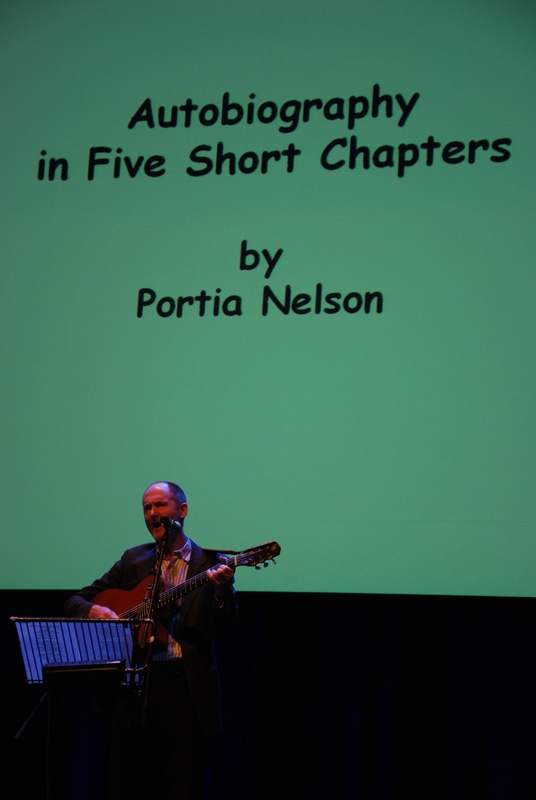 He started off by ‘singing’ ‘Autobiography in Five Short Chapters’ by Portia Nelson, reminding the audience to learn from the problems they encounter and make the necessary progress. In 1974, systems thinker Russell Ackoff differentiates ‘difficulty’ from ‘mess’. A difficulty is often clear cut, explainable, labellable, and solvable with current thinking. A mess is extensive, boundaryless, uncertain, ambiguous, resists change, one where there is no correct view or quick fix, and we often hardly know where to start when trying to deal with it. Often, when there is human behaviour there will more than likely be a mess. However, a systems thinker sees relationships as primary, and things (changes and progress) spring from them. This is in contrast to the traditional view that things are primary and relationships spring from them. Systemic thinking therefore sees connections and relationships rather than isolated entities. Yet, traditionally, our tendency is to default to ‘control’ rather than trying to ‘connect’. ‘Control’ might work with ‘difficulties’, but not with ‘mess’. Thus, traditional, hierarchical top-down approaches are obliged to change because such traditional approaches tend to see decisions that are based on incomplete data, where cause and effect are disconnected and where there are often unintended consequences. As complexity (in companies and in societies) is increasing, such approaches that demand that leadership serves the people and that our jobs has significance (we all want to work because it has meaning for us) no longer work. Instead, we need intelligence dispersed throughout the system and not only at the top. Adrian Underhill then continues to assert the importance of realizing that a leader’s work is essentially very different from the past ideas of heroic leadership, suggesting that we are conditioned to think of the male archetype when thinking about leadership traditionally. After most leadership books are written by men for men. Instead a new field of ‘women’s leadership’ is developing – one which is relationship-based and involved systems thinking. Hence, leadership should be about the activity, and not the person. With this attitude in mind, leadership could in fact come from anywhere. We are all leaders. Then there are leaders of leaders that help the leaders to get on and do it, but not to try and control and do it themselves. Quoting Heifetz’s Adaptive Leadership, Underhill talks about the two kinds of problems: technical ones which can be fixed with our existing knowhow, and complex ones which show a gap between values and reality: gaps that can’t be closed with existing knowhow) and how the essence of leadership is to either help people to adapt values, or to adapt reality, or both. When people are aligned to their purpose, when the gap between values and behaviours closes, what people experience is a stream of ease (Lewin). By aligning purpose and values, and creating a transparent system, we can more easily get useful feedback from the people that we impact on. Underhill then moves on to talk about the learning organization, one that facilitates the learning of all its members ad continues to transform itself (Pedler and Aspinwall). Individual learning can in fact be wasted unless harnessed at organizational level, thus expounding on the fact that a company that does lots of training is not necessarily a learning company. While learning leaders (who continue to learn) lead through their learning, a team of committed managers with individual IQs of 120 could have a collective IQ of 63! In one of his several true-TEFL ‘work-in-pairs’ moment, Underhill gets the audience to rate these following statements from 0 to 10 regarding their organization. It’s easy to get people to listen to and experiment with new ideas and suggestions. When one person learns something new, everyone hears about it. Making mistakes is part of learning. You can be open about it. It is not career limiting. Everyone is involved in discussing school policies before adoption. People in one department know what people in another department are thinking, and they help each other. Underhill then reminds us that systemic thinking requires ‘slow knowing’ (Claxton) where the more patient, less deliberate modes are better suited to making sense of situations that are fleeting, messy and ill-defined, thus allowing for different ways of knowing: cognitive, artisitic, imaginative, emotional and intuitive. Learning to think systematically means seeing more points of views, seeing the whole school as an adventure park for your learning. Thus, our learning mantra should be : See what’s going on, do something different, learn from it. I want to face the problems – unclear, vague and messy that I have discovered to be real around here. 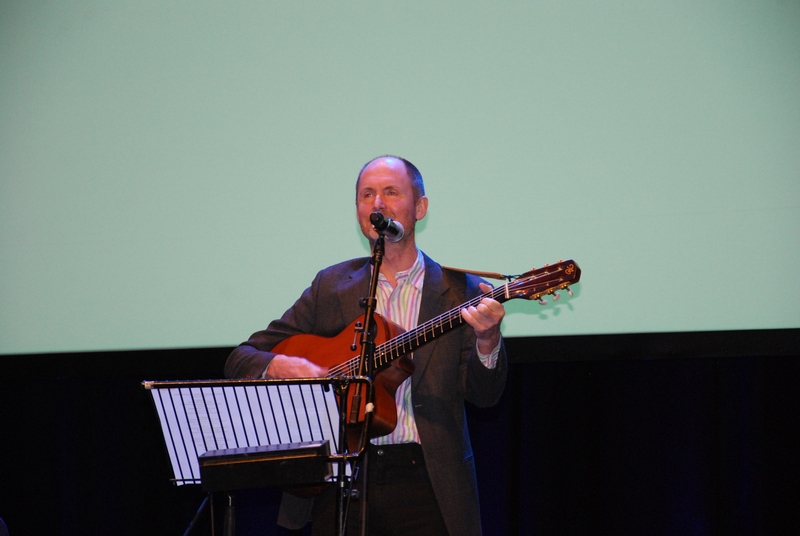 To end the talk, Adrian Underhill treats us to a song on the guitar – Reflective Blues. 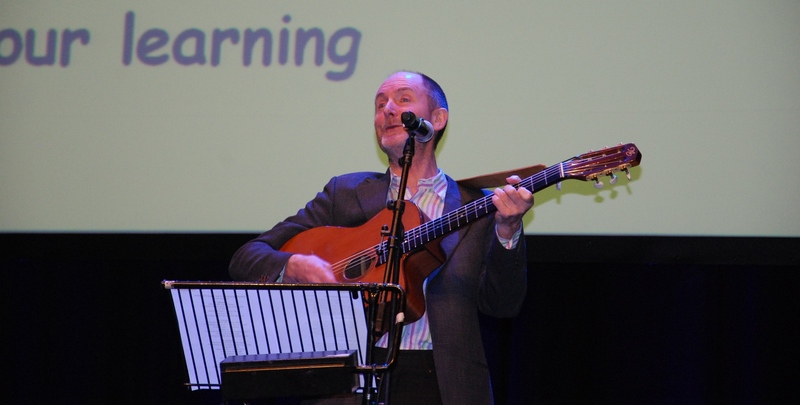 Here’s link to the video…but unfortunately the sound gets a bit muffled in the middle verses (not sure what happened there…I’m really sorry but it gets better again at 2.00mins) but it would at least give you a feel for the relaxed and inspiring atmosphere of the opening plenary, and if this has whet your appetite for more, don’t forget that you can watch the actual talk by Adrian Underhill here at IATEFL Online.